Whether you suffer from back related ailments like bulging spinal discs, general muscle soreness or poor posture, many symptoms can trace back down to a single common cause: gravity. Inversion tables, while they don’t guarantee a permanent fix, are an excellent way of relieving back pain and targeting the root cause of your problems. They work by safely strapping into a specially designed chair and then inverting upside down for a specific period of time. This has benefited by allowing your body to unwind from spine compression, thus relaxing your muscles, rejuvenating spinal discs and improving blood circulation. Build quality and durability go hand in hand when searching for a good inversion table. You will want to ensure that it is made from the best parts available, both for stability and safety. Being able to adjust between a variety of angles allows you to customize your experience for more comfort and versatility. Finally, easy storage is a great bonus feature, and many inversion tables are foldable to afford more convenient storage. With a good balance between price and performance, this inversion table from Ironman delivers excellence with its many features. The sturdy inversion table frame helps reduce stress in your back and stimulates blood circulation. The tubular steel frame strikes a solid middle ground between strength, yet is still fairly lightweight. The memory foam nylon backrest is comfortable and the tough rubber floor stabilizers ensure that there is no skidding during operation. It inverts up to 180 degrees and supports up to 350 pounds of weight. You can fold it down for storage as well. This table is helpful for a number of therapeutic exercises and is available at a reasonable price point. The lower spring-loaded pull pin makes it easy for you to do on-the-fly ankle adjustments. It has a 250-pound capacity, and the safety straps allow you to conveniently control your inverted angles. Furthermore, the safety lock system helps keep the table secure as you’re stretching. 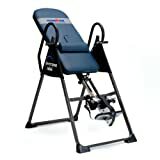 For users looking for a high-end inversion table with exceptional safety and design, check out this model from Teeter. Instead of the traditional plain back cushion, this model includes unique acupressure nodes and lumbar bridge accessories. These specific nodes line the back which assists in providing superior back pain relief. This model has been extensively quality tested to UL safety standards and comes with a full 5-year product warranty. It evens includes stretch and grip handle to work in a variety of more active stretches and a patented pressure-reducing ankle system for better comfort. 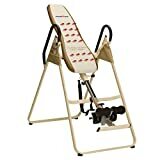 If you’re still apprehensive about spending a lot on an inversion table, check out this one which is inexpensive and perfect for beginners. It features extra long safety handles which make it easy to return to an upright angle. The combination of foam rollers and ankle cushions holds your ankles securely and comfortably. The foam, a vinyl covered backrest is comfortable for both your back and head. It has a 275-pound user weight capacity, and is adjustable for people between 4’10” and 6’6″. Accommodating users up to 300 lbs between 4’10” to 6’6″ in height, this inversion table from Invertio is versatile and simply built. It features a foldable, heavy-duty steel frame. Along with that, it has non-skid rubber feet to ensure your stability and to protect your floors. The adjustable padded ankle supports and extra long handles make it comfortable and convenient to experience, no matter what angle you rest in. It features a full 180-degree inversion angle, allowing you to rest fully upside down. With its wide array of features, this high-end inversion table from Ironman offers a unique and consistent experience. Not only does it deliver the standard inversion benefits for your back, but it also comes with an advanced infrared therapy technology. The carbon fibre heating elements offer a similar soothing massage-like feel that improves blood circulation, decreases fatigue and relieves you from chronic back pain. It inverts 180 degrees, supports 275 pounds, and folds down for simple storage. This is another budget model available from Body Max. The dual-pin adjustment system allows you to adjust the height between 4 feet 8 inches up to 6 feet 3 inches. It has a modest 250-pound capacity, and the ankle hold is easily adjustable with its spring-loaded pull pin. The safety strap gives you the ability to adjust your angle with ease, and the foldable frame makes it convenient to store. Inversion tables aren’t just for back pain relief and therapy. This combination inversion table from Ironman combines the traditional benefits with an abdominal training system. In fact, abdominal training can help decrease back pain by tightening your core, so there’s more balance with your back. It features an extra wide oval tubing steel frame that is sturdy. The 2.5″ nylon backrest comes with memory foam, which is among the best-rated mattress types. 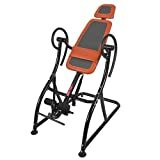 It is adjustable up to 6 feet 6 inches and supports up to 320 pounds. There are 10 inversion angles you can lock into and grips for stretching exercises. 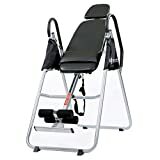 This adjustable deluxe model from Best Choice Products comes in a heavy duty steel frame and has a large max weight capacity of 300 pounds. Its overall dimensions are 46″ x 30″ x 56″ (length x width x height). The backrest can adjust for users with heights between 4’10” and 6’6″. The sturdy hardware and back cushion let you get comfortable without any worry about the table fails. You can adjust the angle to a full 180-degree inversion and there are 5 leg position adjustments. Featuring new improvements from the traditional style inversion tables, this model offers great value at a very affordable price. It features a smooth finish fabric with luxury embroidered stitching. The comfortable cushions along the neck and waist make it easier to settle into. It comes with a steel safety rail design and also folds for easy storage. It is strong enough to handle users of varying sizes and shapes. Also, it is easy to assemble and very practical to use.